Shooters Ridge/Champion 30 Round 10/22 Magazines use a double stack system to fit more ammo into a smaller space. These double stack magazines are actually more compact than conventional 25 round 10/22 magazines. And now available here in a METAL FEED LIPS version! 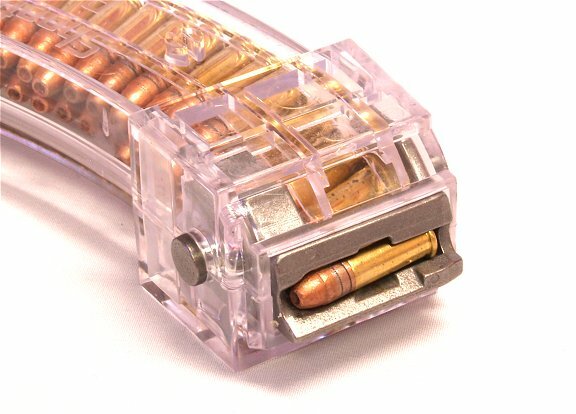 Like other high capacity magazines, These double stack mags have side connectors that can snap together for "Jungle Clip" configuration. Worth checking out! See all of our mags and accessories at our Ruger 10/22 Home Page. CA, CO, CT, Washington DC, HI, MD, MA, NJ, NY and below cities in IL.